As mentioned in my last post, I'd like to outline a rough overview of my values and goals for this year. As [imperfect] humans, we oscillate in and out of our ideal selfs. We experience pride in having done the "right thing", and at other times we experience regret at having done actions that oppose our morals. I struggle to be in the moment. I'm quite often in my head and not fully "there". My lack of presence diminishes the value of every moment. I will work deliberately to be more present in 2017. For whatever reason, I'm inclined to want things now and tend to lose my patience quite quickly. I must work to be more patient this year. Good things come to those who wait. Discipline is a crucial component for achieving tough goals. I consider myself somewhat disciplined, but if I am to reach my theoretical peak mental performance then I must crank my discipline up a few notches. Discipline means doing the things you need to do at the expense of the things you want to do. I've always been quite active and had a natural inclination to eat relatively healthy. Despite my natural tendencies I have to improve my health (both mentally and physically) from its current state because my lifestyle requires it. My body is always tight and soar due to my past life as a high-level soccer player. As such I must ensure that I manage my injuries & contusions to prevent further problems down the road. Being the short-fused and anxious guy that I am, I must also improve my mental health by way of extending my metaphorical fuse and ridding myself of my anxious tendencies. I am naturally reserved. I keep to myself and seem to have a difficult time opening up to people. I believe there is a better way to live life. I should be open and honest, and not hide who I am to anyone, regardless of who they are. This is a willingness to be vulnerable and an attitude of selfless giving as opposed to a shielded attitude of fear and anxiousness. Being more open and honest, even if brutally so, is a key component of this value. This requires that I let go of my preoccupation with others' perceptions of me. A want to do things for myself and not have to depend on others. Treat myself to things I like. Be kind to myself. Self indulgence is OK to a sane degree. More independent thinking. Less time spent on the echo chamber that is social media. My ambition is to be my ideal self as often as possible, which means sternly adhering to the above values. Every time I get into the habit of meditation, I feel incredibly at peace, calm, and more energetic. Then for one reason or another I invariably break the habit. This year I want to make sure I cement meditation as part of my lifestyle for the rest of my life. Even if you don't believe in any of the mysticism associated with meditation, it has been scientifically proven to benefit you. So I encourage you to try it this year as well! Tara Brach has some amazing guided meditations. And if you want to learn more about meditation, this is a great book to get you started. My goal is to meditate at least once a day five times a week. Social media, and in my case Hacker News, creates a great sense of FOMO. These websites make me feel like I need to keep up with the latest software trends. As such I get overwhelmed when I realize there isn't enough time to learn and do all of the things I find online. This year I want to have well-defined priorities to navigate through all the enticing noise the internet throws at me. I'll have a blog post that will go deeper into my framework. As an introvert I tend to spend a lot of time alone even though I have many friends and family who care about me. My lack of communication with these people sometimes distances them and dilutes the relationship. I am a caring person and I want to show that this year. Much like Cal Newport mentions in his blog post, I am both in love and disheartened by technology. On the one hand I see very clearly how it can help humanity overcome its current problems and bring more peace to society. On the other, some of its uses are sucking the life right out of us. Facebook has been shown to induce envy, egotism, depression, and other not-so- fun feelings. The NSA's (& GCHQ, etc.) overreaching power is threatening free speech, creating the obedient and docile society any tyrannical power would dream of. We have to be conscious to use the tools that really do benefit us rather than strive to push away boredom from our lives. 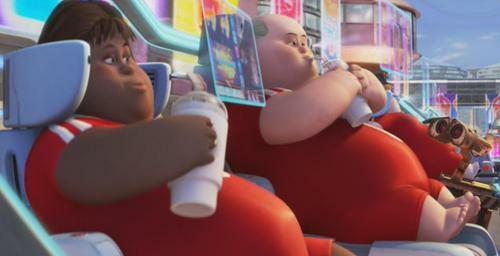 In the movie Wall-E, people are depicted as no longer needing to walk due to hover chairs being invented. This leads the human species' bone structure to change, making it impossible for them to do anything more than make awkward steps in search of their hover chairs. Obesity and incessant distractions are the norm. The notion of [critical, independent] thinking is a thing of the past. A problem with the unfiltered use of consumer-facing technology is that most of it is designed to keep you using it for as long as possible. Our attention span is these companies' money maker. It's also your money maker. Protect it aggressively. I cannot emphasize how beneficial blogging is. Even if nobody reads your blog, it helps you in so many ways beyond just branding. Your writing skills improve. Your creativity improves. Your focus improves. The list goes on. I've always been in decent shape, but not so much because I work out often but because I'll sporadically do health-related things such as bike to work or go to a park to play soccer for a bit. I'd like to wake up earlier in the mornings. I find I am most productive during this time of day, but I struggle to get out of bed. Considering my current job requires me to code almost all day, it would be a prudent investment to better understand the technologies I work with and depend on. Improving my understanding of technology is also a good investment in my human capital, and a good asset to have whether I'm looking to start a company with someone or attain a new job. I possess a bit of an obsessive personality. When I want to do something, I go all-in 100%. This is great from a get-things-done perspective, but awfully bad when it comes to having a balanced lifestyle. I can't say I value a balanced lifestyle much. But I do know that my current lifestyle is a bit too extreme in some aspects. This is still a rough idea of my goals. Not much has been said about how they'll actually be accomplished. I found a great article called 8760 Hours that I'm using as the framework to plan out my goals and values for this year. In it I'll discuss some of the details of my self-improvement plan for 2017.